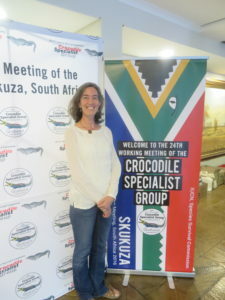 In May, I spent six days in South Africa’s Kruger National Park, participating in a meeting of the Crocodile Specialist Group. 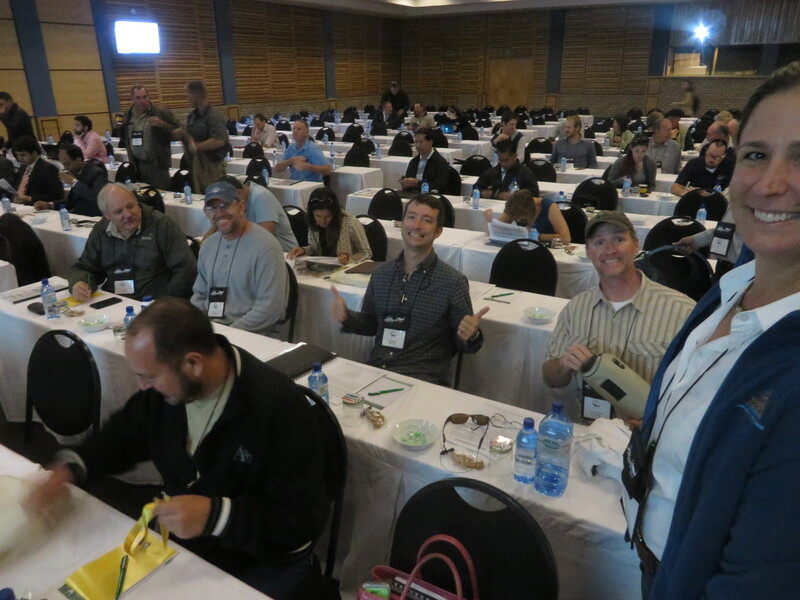 The “Crocodile Specialists” are an eclectic group of scientists, managers, veterinarians, community organizers, adventurers, and industry people who meet every two years to talk all things croc. This is my second time attending the CSG, and I’ve noticed on both occasions a slight element of crazy, conferring a certain zest that is missing from more mainstream conferences. Consider my colleague, Dr. Matt Shirley. Imagine hiking through tropical jungle for two days, rappelling into a dark crevasse with a headlamp, wading waist-deep in bat guano through an unexplored (until now) bat cave in equatorial Africa, all in search of an orange crocodile that is new to science. You then proceed to capture said crocodile and many of her friends to find out what they eat, take tiny skin samples for DNA, and document that their color is completely different to their cousins living in the forest near the cave. From this, you determine that the cave crocs are an isolated lineage, evolving independently from the outside forest community. That’s just one of the stories. Presenting in the same session as me was Dr. Larissa McLeod, who had surveyed the Crocodile Specialists to ask what diseases we encounter most often. She showed a slide with a lengthy list that included predictable worthies like malaria and schistosomiasis, but also a bunch of diseases with long names and horrible pictures that are (happily) less familiar. She showed range maps for each of the ten diseases she decided to highlight, and I was pleased to note that Botswana generally (though not always) was not a hotbed of infectious incubation. Dr. McLeod’s advice at the end of her talk was excellent – get vaccinated for the things you can vaccinate for, avoid getting bitten by disease vectors (like mosquitoes), get medical attention immediately if you develop remarkable symptoms like high fever, and carry basic first aid, including rehydration salts, antibiotics (ointments, oral), and something for pain and fever – like aspirin or Tylenol. I would add to that – do your research, know where you are going and what you are getting into when you choose to work in the tropical watery places of the world. My presentation at the meeting went well. It lacked the shock-value of elephantiasis and the ick-quality of waist-deep guano, but I finished on time and my message was solid. We had tested if drinking water contaminated with nitrate increases the risk that alligators will develop type 1 diabetes. “Whoa” you might say! Alligators can get diabetes? What’s nitrate? And how does that affect me? It seems like everyone can get diabetes these days. Though I should point out that type 1 and type 2 diabetes are quite different and follow different progression pathways, although both result in the same outcome of increased blood sugar levels. Type 1 diabetes tends to affect children and young people and happens when a person’s pancreas starts losing insulin-producing beta cells. People with type 1 have to take insulin. Type 1 was rapidly fatal until the 1920’s when pharmaceutical insulin first became available. We don’t know if alligators can get diabetes – that’s partly why we did the experiment. After 5 months of drinking water with 100 mg/L nitrate-nitrogen, the alligators in our study had lost about 13% of their beta cells and their blood glucose levels were elevated, though not above the normal range for gators. For comparison, by the time people are diagnosed with T1D, they’ve lost 70-80% of their beta cells. 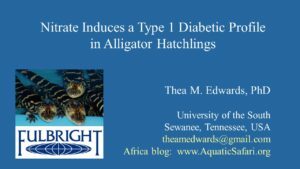 Our alligators had other signs of early stage type 1 diabetes as well. A longer study is needed to find out if nitrate can cause full blown diabetes in alligators. So how did we come up with this experiment? The larger problem is this: Nitrate comes from fertilizers and sewage. It’s been called the “other global pollutant” second only to carbon dioxide in the vast global problems it’s causing. When you see ponds at golf courses that are full of algae – it’s because the water has high nitrate. Nitrate from farms and sewage facilities gets into rivers and ground water, and then into wells where it becomes part of the drinking water supply. Something like 13% of wells in the United States have nitrate levels higher than government mandated standards. What people have noticed is there are hotspots of type 1 diabetes incidence in places where drinking water nitrate is high. This association could be a total coincidence and doesn’t hold true in all situations, but we decided to check it out. This is why we did our alligator experiment. And why alligators? Because we’ve worked with them for a long time and know a lot about their development. Also, they live a long time (like people) and inhabit watery places that get contaminated with nitrate. So, like tilapia, they are a good environmental sentinel species. This affects you, me, our families because it’s more evidence that human-made pollutants are causing health problems that affect quality of life, longevity, prosperity, and most importantly our children. 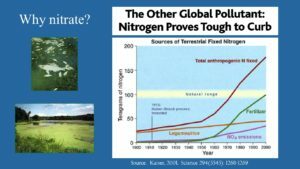 We might need fertilizers to grow crops and we definitely can’t avoid the production of sewage, so nitrate sources are not likely to go away. But there are lots of ways to improve. We can increase our awareness, be more efficient, contain and treat our waste better, and value clean water for the wonder that it is. Heck, if we’d stop adding so many pharmaceuticals to our sewage*, we could use it to fertilize our fields and simply close the loop. *When a person takes medication(s), they get metabolized and leave the person’s body in urine or feces. One of the biggest challenges for modern day sewage treatment is to remove metabolized pharmaceuticals from waste water before it is redistributed to rivers or aquifers.